Single and triple accommodations may be available; ask us about rates. Booking deadline is December 21, 2018, or until sold out. 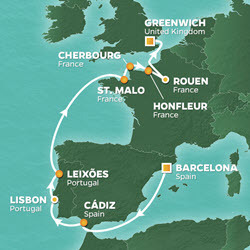 Take an immersive journey through Spain, Portugal, France and England, arriving in Normandy on the eve of the 75th anniversary of the D-Day landing and in Rouen, France, during the Armada of Tall Sail Ships celebration. Your adventure starts with an overnight hotel stay in Barcelona, Spain. Join your Bluegreen host and fellow owners for a Welcome Dinner and Flamenco Show and an architectural tour of Spain’s second-largest city. Then board the Azamara Journey, a mid-sized luxury ship, for a 14-night cruise of remembrance. We’ve included private group excursions in multiple ports so you’ll see all the highlights of these historically significant cities. Visit the Palace “Las Dueñas” and take a flamenco dance lesson in Seville, Spain. Explore the Old Town and taste the Port wines of Porto, Portugal. At. St. Malo, France, tour iconic Mont Saint-Michel, a legendary Benedictine Abbey with a gravity-defying medieval monastery; it’s been designated a UNESCO World Heritage Site. Your excursion at Cherbourg, France, relates the story of the D-Day landing and the heroism of the troops that won this momentous battle of World War II. You’ll see Sainte Mere Eglise, which fell to American airborne troops in the early hours of D-Day, and visit the Airborne Museum, which houses a C-47 troop carrier, a Waco glider and lots of photos and World War II memorabilia. You’ll stop at Utah Beach and see Point Du Hoc, where Rangers scaled the 100-foot cliffs to seize a German observation post. You’ll have two overnights in port in Rouen, where every five years the finest and largest sailing ships from all over the world arrive for the Armada of Tall Sail Ships, a week of concerts, parties and fireworks. Your ship will be right in the heart of action! From Rouen you can take optional excursions to see the sights of Paris, the “City of Light.” Your journey ends with an overnight in port in London and an included private group sightseeing excursion with afternoon tea at Harrods. Join us on an unforgettable European adventure! PLEASE NOTE: The details for the shore excursion to Mont Saint-Michel on June 4 have changed slightly as of October 22, 2018. Welcome to Barcelona, Spain’s second-largest city. You will be transferred to the NH Collection Gran Hotel Calderón, a stylish accommodation located just a few minutes” walk from the city center’s famous landmarks and Las Ramblas and Plaza Catalunya. The hotel has an rooftop swimming pool, well-equipped gym, bike rentals, free Wi-Fi and an on-site restaurant and bar. Early check-in is guaranteed so you can rest and refresh before joining your Bluegreen host and fellow Bluegreen owners this evening for your Essence of Barcelona group excursion that includes a Welcome Dinner and a Flamenco show at the El Palacio del Flamenco, a restored theater located in the heart of the city center dating back to 1920. Savor the unique treats and tastes of Barcelona at a three-course meal of authentic Catalan cuisine and be swept away by pure Andalusian flamenco dancing, guitar playing and songs. You’ll even have a chance to learn some flamenco moves yourself! Dinner is included today; overnight in Barcelona. After breakfast at the hotel, you’ll have an included half-day Essential Gaudi Architectural Tour group excursion in Barcelona. Antoni Gaudi was Barcelona’s most famous modernist architect and built his most renowned masterpieces here. Take a panoramic drive through the stunning scenery surrounding Barcelona and view Gaudi’s Sagrada Familia church, one of Barcelona’s most characteristic buildings. Started in 1882, it remains unfinished to this day. Go inside Gaudi’s first house, Casa Vicens, built in 1888, and discover other of Gaudi’s impressive buildings, including Casa Mila or La Pedrera, a UNESCO World Heritage Site. Your tour ends at the cruise pier, where you’ll board the Azamara Journey and enjoy lunch as you begin your 14-night sailing. Breakfast at the hotel and lunch and dinner aboard ship today; overnight aboard ship. Today you are free to explore your boutique hotel at sea and enjoy all its amenities. The onboard experience is akin to what you’d find at the world’s most exclusive hotels. Comfortable and never crowded, you’ll love the attentive and genuinely friendly staff ready to serve you aboard the Azamara Journey. Indulge in a treatment at Sanctum Spa, stay ship shape with a class at the fitness center or lounge the day away on the sunny pool deck. In the evening, savor inspired Italian cuisine at Aqualina or relish in a classic steakhouse experience at Prime C. Find plenty of exciting evening entertainment, from thrilling shows at Cabaret Lounge to intimate performances in the Living Room. All meals aboard ship today; overnight aboard ship. Andalusian adventure awaits in Cadiz, one of Europe’s oldest cities. The crown jewel of the city is the Cadiz Cathedral. Discover influences of ancient Rome, delicious Spanish cuisine and beautiful beaches with views of Morocco here. Your all-day included Spirit of Seville & Its Hidden Treasures group excursion will highlight the Andalusian way of life. Take a motorcoach to Seville, traversing rolling countryside dotted with olive and orange groves, vineyards and farms. You’ll have a photo stop at the stunning Plaza de Espaňa, the Spanish Pavilion during the World Exhibition of 1929, followed by a guided tour of the Palace “Las Dueňas,” built between the 15th and 16th centuries and only recently opened to the public. Enjoy a traditional tapas lunch at a local restaurant in Seville’s old town before learning more about the music of Spanish gypsies at the interactive Museum of Flamenco Dance, the only one of its kind in the world. A teacher will show you the intricate steps and passionate movements of the dance during an exclusive group flamenco lesson. Breakfast and dinner aboard ship and lunch on your excursion today; overnight aboard ship. Welcome to Portugal! The ship arrives in Portugal’s capital city this afternoon. One of the oldest cities in the world, Lisbon is rich in architecture and criss-crossed by monument-studded grand boulevards. From beautiful monuments to the ancient art of tiles, Lisbon is a complex city rich in culture, breathtaking landscapes and history. It also has old historical villages that have become a staple of Portuguese culture, like the Aldeia Velha de Monsanto, which was built in such a way that it’s fused with the granite mountain around it. It has one of the most iconic landmarks in the country, a huge rock sitting on top of a house. Other Lisbon must-sees include the church of Igreja de Sao Vicente de Fora, which dates back to the 12th century; Musee Calouste Gulbenkian, one of Europe’s leading fine arts museums; and Torre de Belém, a UNESCO World Heritage Site and one of the most famous monuments in Portugal. Book an optional excursion to suit your interests. You’ll be staying in port overnight, so you can experience Lisbon’s nightlife. All meals aboard ship today; overnight aboard ship. The ship remains in port until early evening, so there’s plenty of time for shopping or more exploring. All meals aboard ship today; overnight aboard ship. At the mouth of the Rio Douro lies the city of Porto, the second-largest city in Portugal known mostly for its port wine trade. Your included full-day Port & Porto group excursion starts with a scenic drive around Porto’s city center. Stop at impressive St. Francis Church, with construction beginning in the 14th century. The interior, completed in the 18th century, amazes with its gold-encrusted high altar, columns and pillars. Next is time in Old Town, a UNESCO World Heritage Site where you’ll find the iconic Cristal Palace, 18th-century Clérigos Tower and the 12th-century Cathedral or Sé. See the Medieval Quarter with its charming narrow streets before you board a boat for a cruise on the Douro River. On the opposite bank you’ll see Gaia, home to the port trade and numerous wine lodges, most established in the 18th century. You’ll stop at a wine lodge for a Port wine tasting, followed by lunch at a traditional Portuguese restaurant. After your excursion, you will have free time to explore the city on your own before you return to the ship. Breakfast and dinner aboard ship and lunch on your excursion today; overnight aboard ship. Enjoy a day of relaxation aboard the Azamara Journey as it sails to France. All meals aboard ship today; overnight aboard ship. Welcome to France! You’ll arrive in port in the early afternoon to begin your included full-day Mont Saint-Michel group excursion. You’ll have a one-hour drive through Normandy to Mont Saint-Michel, a monument often regarded as the “Marvel of the Western World.” The motorcoach will stop in the parking area and you will walk to a public shuttle bus that will take you to the village entrance (shuttle buses arrive every five minutes). Around the base of the monument are the ancient ramparts and a jumble of houses lining the narrow streets. A guide will lead you up the cobbled street and 365 steps to access the famous Abbey, a magnificent edifice comprised of a pre-Romanesque church begun in the 8th century and a series of Romanesque and Gothic monastery buildings. After the tour, you’ll have some free time to explore the village or grab a quick snack on your own. At the conclusion of your visit to Mont Saint-Michel, you will rejoin your guide and walk back to the shuttle. The motorcoach will take you back the ship Breakfast and lunch aboard ship; overnight aboard ship. PLEASE NOTE: The Mont Saint-Michel excursion involves strenuous uphill walking with lots of steps, cobblestones and uneven ground. This tour is not possible for guests in wheelchairs or guests with walking difficulties. Occupied by the Germans in World War II, Cherbourg has long been a city of maritime significance. Your included full-day D-Day Discovery group excursion includes an immersive look at this momentous battle on the eve of its 75th anniversary. Start along the Cotentin Peninsular to Sainte Mère Eglise and the Normandy invasion sites. Sainte Mère Eglise fell to American airborne troops in the early hours of D-Day, and at 4:30 a.m. the first American flag to be flown on French soil was unfurled at the town hall. Visit the town’s Airborne Museum, which is built in the shape of an opened parachute. Its exhibits include a C-47 troop carrier and a Waco glider. Drive along the coast through Sainte Marie du Mont to Utah Beach, where the American 4th Infantry Division landed, and stop to visit one of the landing beaches. Enjoy a traditional Normandy lunch with wine at a local restaurant before seeing Pointe Du Hoc, where Rangers scaled the 100-foot–high cliffs on rope ladders to seize a German observation post, and Arromanches, the artificial harbour where thousands of troops and their supplies came ashore and brave young American soldiers battled for two days. After this tour of remembrance, you’ll return to your ship. Breakfast and dinner aboard ship and lunch on your excursion today; overnight aboard ship. PLEASE NOTE: The D-Day Discovery excursion involves approximately 1-1/2 hours of walking on cobbled streets at Saint Mère Eglise and gravel and sand at Utah Beach. Flat, comfortable shoes are recommended. Today is the 75th anniversary of the D-Day landing. You may choose to book an optional excursion to the many World War II-related sites in the area, or take time to reflect on the events that happened here in your own way. Honfleur is a lively port and the maritime influence is evident. Even Sainte Catherine church has a ceiling resembling an overturned ship hull. The square surrounding the church gives way to cobbled lanes of half-timbered houses and elegant manors. The quality of light has long attracted artists, including Monet, Turner and Seurat, all of whom stayed at Saint Siméon, now Honfleur’s most luxurious hotel. Your ship stays in port until late this evening. All meals aboard ship today; overnight aboard ship. Every five years, the finest and largest sailing ships from all over the world arrive in Rouen after winding their way up the River Seine through Normandy for the Armada of Tall Sail Ships. It’s a week of concerts, parties and fireworks. You’ll appreciate your ship’s parking spot in the heart of the action. Rouen is home to the Cathedral of Notre Dame, its cast-iron spire the tallest in France. Get lost in the old town’s labyrinth of lanes and stop for a moment at the Rehabilitation Cross, where in 1431 Joan of Arc was consigned to the flames. Paris, the “City of Light,” is about a two-hour drive away. Your ship stays in port here for two nights, so you’ll have plenty of time for on-your-own exploring, or book an optional excursion. Stroll along the Champs Elysées, take in the view from the Eiffel Tower or immerse yourself in the art at the Louvre. All meals aboard ship today; overnight aboard ship. Explore more of Rouen or Paris on your own. Your ship stays in port overnight. All meals aboard ship today; overnight aboard ship. Your ship leaves Rouen in the early afternoon. All meals aboard ship today; overnight aboard ship. Welcome to England! Your ship arrives in the early afternoon. Your London Sightseeing & Afternoon Tea group excursion includes London’s most recognizable and beloved cultural and historic monuments. Drive by the imposing Tower of London, where some of history’s most notorious prisoners were kept. Trace the River Thames to admire the buildings along the famous Thames Embankment. The Mall, London’s ceremonial avenue, leads you past St. James’s Park to spectacular Buckingham Palace. You’ll stop at Harrods to participate in that most English of institutions, the afternoon tea, served in the spectacular Georgian Restaurant. Enjoy a selection of finely cut sandwiches, freshly baked scones, jam, clotted cream and a range of delicate pastries from the famous Harrods Patisserie. Your sightseeing continues with views of Big Ben and the Houses of Parliament, and you’ll have a photo stop at Westminster Abbey before returning to the ship. All meals aboard ship today; overnight aboard ship. Your Tall Sails & D-Day Remembrance adventure ends after breakfast this morning. Following disembarkation, you’ll be transferred to the London airport. Breakfast aboard ship today. Call 800.459.1597 to Book Your Tall Sails & D-Day Remembrance Adventure Today! **BLUEGREEN TRAVEL SERVICES ONBOARD CREDIT OFFER TERMS & CONDITIONS: $125 onboard credit per stateroom available when booked through Bluegreen Travel Services by December 21, 2019. Onboard credit may be used for select purchases aboard the cruise ship and has no cash value. New bookings only. Subject to availability. Terms and conditions apply. All rates are per person, based on double occupancy, cruise only, in USD, subject to availability, and for individual bookings. Rates may vary by ship, departure date, and stateroom category. All rates, offers and itineraries are subject to change without notice. Offers may be withdrawn at any time. Government taxes & fees are additional. Azamara Club Cruises reserves the right to impose a fuel supplement on all guests if the price of West Texas intermediate fuel exceeds US $65 per barrel. The fuel supplement for 1st and 2nd guests would be no more than US $15 per guest, per day, to a maximum of US $200 per voyage. See complete Terms & Conditions. Price is per person based on double occupancy and includes hotel accommodations in Barcelona, Spain; Essence of Barcelona Welcome Dinner & Flamenco Show in Barcelona; Essential Gaudi Architectural Tour excursion in Barcelona; 14-night cruise aboard the Azamara Journey; all meals aboard ship; Private Group Cocktail Reception aboard ship; chocolate-covered fruit delivered to stateroom aboard ship; $125 onboard credit per cabin; private group shore excursions as outlined in itinerary; airport transfers in Barcelona on May 27 and London on June 11; gratuities for tour guides, drivers and cruise staff; and port and security fees and taxes. For U.S. residents only, travel Protection will be purchased on your behalf by Bluegreen Vacations when you book this Owner Adventures vacation package. No refunds will be made for included group excursions that guests choose not to take or are unable to participate in. Offer includes Private Group Cocktail Reception invitation for first and second guests in cabin only. Limit one ticket per paying passenger for included shore excursions, as noted. Onboard credit may be used for select purchases aboard the cruise ship and has no cash value. Reservations must be booked by December 21, 2018. Nonrefundable, non-transferrable deposit of $1,000 per person is due at time of booking. Final payment due by December 21, 2018. Prices, additional fees, itineraries and availability are subject to change without notice. Certain terms, conditions, and restrictions may apply. Please call us at 800.459.1597 for additional information. Fares shown are in U.S. dollars for new reservations only and are subject to availability. Not included: airfare, gratuities for hotel housekeepers, top-shelf alcohol aboard ship, beverages, food outside of included meals during land stay and provided aboard ship, meals in specialty restaurants aboard ship, optional excursions, baggage fees and all other items of a personal nature. Great Vacation Destinations, doing business as Bluegreen Travel Services, is located at 12400 S. International Drive, Orlando, FL 32821. Great Vacation Destinations is registered with the State of California as a Seller of travel Reg. No. 2068362-50 (registration as a seller of travel does not constitute approval by the State of California); Washington Seller of travel Reg. No. 602-283-711; and registered with the Airlines Reporting Corporation (“ARC”) number 15-72225-4. In the event of a conflict between Azamara Club Cruises’ Details of Participation and Great Vacation Destinations’ Details of Participation, Great Vacation Destinations’ Details of Participation shall govern.